Hay fotografías que se compran sencillamente porque uno piensa que el fotógrafo, sea quien sea, ha acertado en la realizacion de la foto. Esta foto, realizada por un fotógrafo que firma sencillamente González-Sevilla, es uno de esos casos. 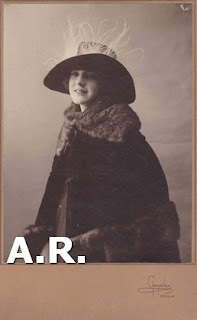 La joven, de perfil, con abrigo con puño y cuello de piel y sombrero grande con plumas, nos mira alegre y tranquilamente a la vez, segura de sí misma. .............Retratista interesante. Gustó utilizar el formato llamado Mignon , acababa sus copias en un delicado sepia al sulfuro. There are photographs that are bought simply because one thinks that the photographer, whoever he is, has made the right decision in the realization of the photo. This photo, made by a photographer who signs simply González-Sevilla, is one of those cases. The young woman, in profile, with coat and fur collar and big hat with feathers, looks at us happily and calmly at the same time, sure of herself. ............. Interesting portraitist. He liked to use the format called Mignon, he finished his copies in a delicate sepia with sulfur.